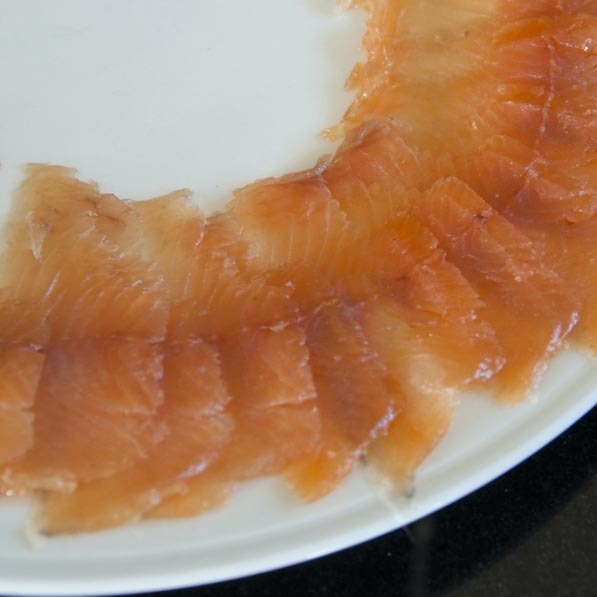 Smoked trout – like its close cousin smoked salmon – is one of the great ‘luxury’ foods. I find I prefer it – the finished product, while it looks very similar to salmon, has a more delicate flavour with less of the aggressively-fishy oiliness which can characterise smoked salmon. It’s much less readily available, too – and can certainly be expensive, a quick google suggests prices from £40 – £80 a kilo direct from a number of British producers. Expect further mark-up in a smart London delicatessen! 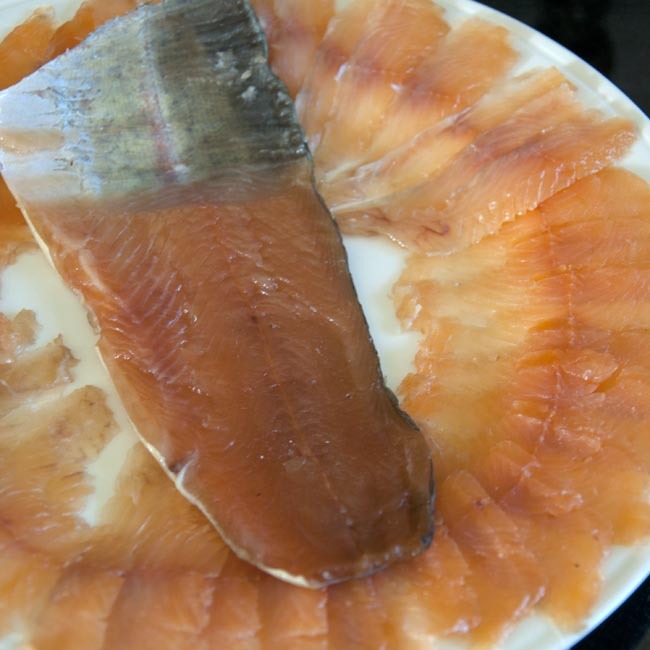 Of course, if I were just writing this in praise of smoked trout and telling you to go and buy some from a smokehouse on the internet, it wouldn’t be the country skills blog! 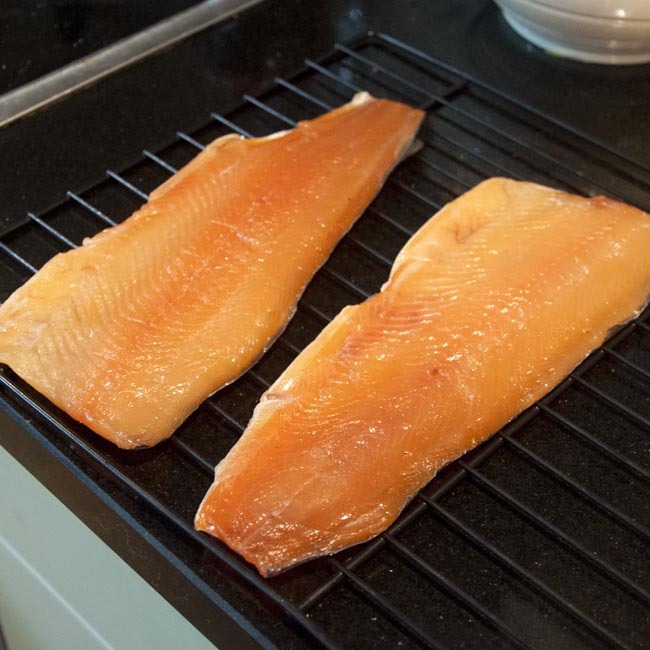 Making smoked trout at home is straightforward, and produces a first-class product which is the match of anything you’ll buy from even the most up-market smokehouse or deli counter. Better still, it costs a fraction of the commercial product. 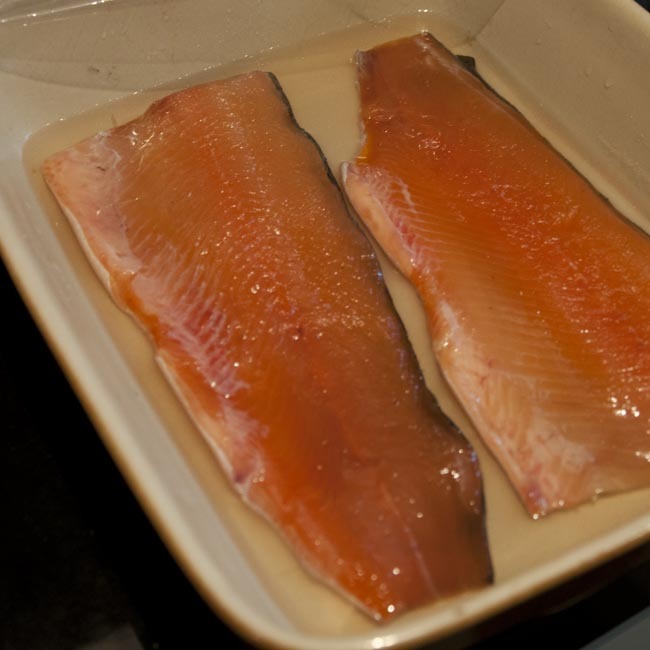 The two fillets of rainbow trout I cured and smoked for this post cost the princely sum of £1.53, with a combined final weight of a little over 200g – including other ingredients and consumables, that’s a total cost of well below £10/kg. A little luxury, then, that we can all afford to enjoy a bit more often! You’re going to be eating this fish raw, effectively, so freshness is of the essence. Choose a lovely fresh whole trout – with bright clear eyes, red gills and no ‘fishy’ smell – and have it descaled and filleted for you by the fishmonger (or do it yourself – it’s not that tricky really!). Good quality farmed trout is readily available, even on supermarket fish counters, and if you can get hold of a lovely fresh wild fish, even better! 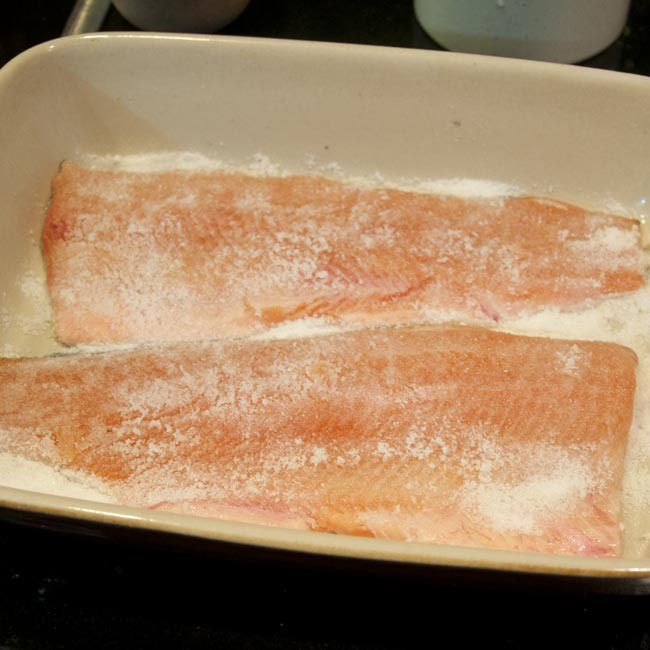 Avoid pre-packed fillets, whose freshness it is more difficult to be certain of. Wash the fillets off carefully under the tap, to remove all the mucus coating from the skin. Make sure you’ve removed all the rib bones and pin-bones (the small pointy bones that run along the middle of the fillet) – a pair of tweezers is very useful here. This will take a few minutes, but is worth the effort to do properly. Then rinse the fillets and dry them carefully with kitchen towel. Weigh the fillets and make a note of this weight. The cure I use for trout and salmon is very simple – made up of 1/3rd sugar (golden caster sugar is my favourite here) and 2/3rd table salt. I favour a short curing time – just overnight – with an excess of dry-cure so that the cure stays saturated throughout. Be generous – you can afford to be, since the ingredient cost is very low – in the scale of pence for a couple of fillets. You want a thin layer of cure in your non-metallic dish below the fish, and a good coating over the top. The photo gives a good idea of the sort of coating you’re aiming for. 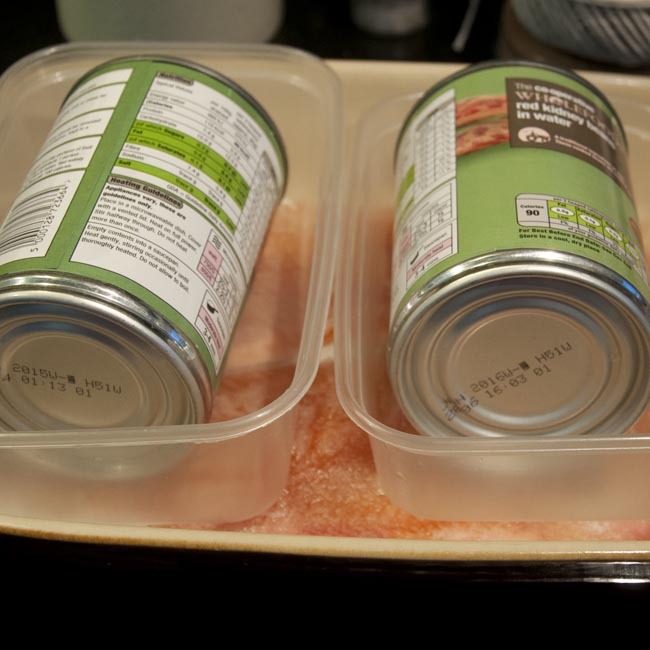 You then want to weigh down the fillets to help draw water out – you’ll need to improvise something – I found a couple of plastic ‘take-away’ containers fitted very nicely in my dish, and then weighed them down with tin cans. Don’t use anything metallic in direct contact with the curing fish. Put the salted fillets in the fridge. I would tend to get the cure going when I get home from work, having collected my fresh fish on the way home – so just before bed I turn the fillets over in the cure, and replace the weights before putting them back in the refrigerator. The next morning, there will be quite a lot of liquid in the dish and most of the cure will have dissolved. Take the fillets out of the dish, noting the change in texture – the skin will have taken on a harder, almost cardboard character, and the flesh will be firmer and more translucent. Rinse and dry the fillets, and weigh them again, and note down the reduction in weight. My fillets had dropped from a starting weight of 256g to 220g at this stage – a 14% water loss. You’re aiming for a final loss of ~18% by the end of the process, so that’s well on target. Now place the fillets on an open plate, uncovered, in the refrigerator for 24 hours before cold smoking. You may have read this far, and are now thinking ‘well, that’s no use to me – who has a cold smoker at home?!’. 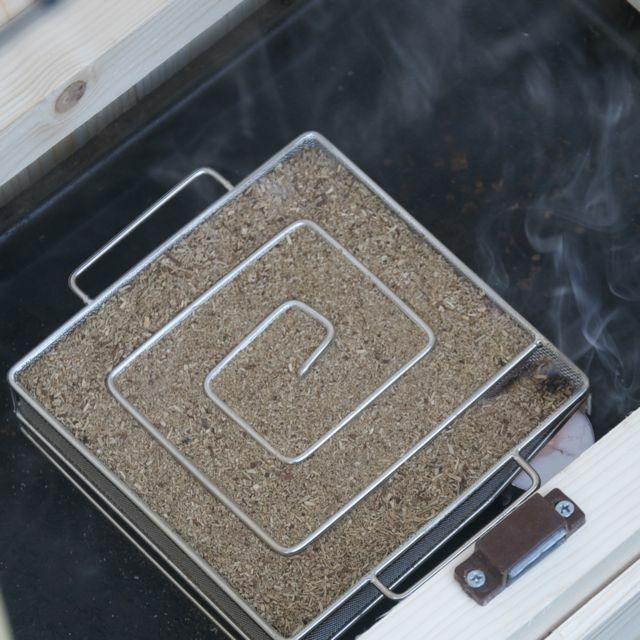 At it’s simplest, cold smoking requires two things – a source of cold smoke (from smouldering sawdust, for instance), and a space in which to contain it. Last year, I built a wooden tower smoker, but there’s no need to start with a construction project. A cardboard box, or a (clean!) upturned bin or barrel, rigged up creatively with a rack or two, will do just as well for the occasional smoking job! You will need a smoke source, and I can heartily recommend the ProQ Cold Smoke Generator, which is a nifty little gadget which entirely takes any stress or complication out of the process. It’s a little pricey (around £35 at this time), but will pay for itself incredibly quickly once you get the smoking bug! It reliably provides 10 – 12 hours of cold smoke (depending on the temperature, humidity, and your sawdust choice) with very little heat production. Have a look at the Supplier’s List for suggested sources of smoking and curing supplies. Choose a day without too much wind or rain (the occasional shower isn’t important), and where the temperature is roughly between 5 degrees and 15 degrees centigrade. I’ve successfully smoked between 0 and 5 degrees but smoke penetration is less effective. Colder, and your fish will freeze rather than taking smoke. Warmer and the risk of spoilage increases considerably – though cold smoking temperatures up to about 20 degrees are cited in some places. Get the smoker going first thing in the morning, and leave it for the day – though I would keep it under much closer supervision if using a cardboard box!. I used a mix of alder and maple sawdust for this smoker burn (about 10% maple) – this produced a gorgeous neutral smoke-flavour with very little bitterness and with a noticeable ‘sweet’ note, presumably from the maple. It’s definitely a mix I’ll use again in the future. Once the smoke generator has burned all the way through, unload your smoker, and take a final weight on your fillets. They should have lost another 4 – 5 %. They will have a lovely orange-pink colour with a noticeable translucency and a glossy surface. Then wrap them tightly in cling film, and freeze them. 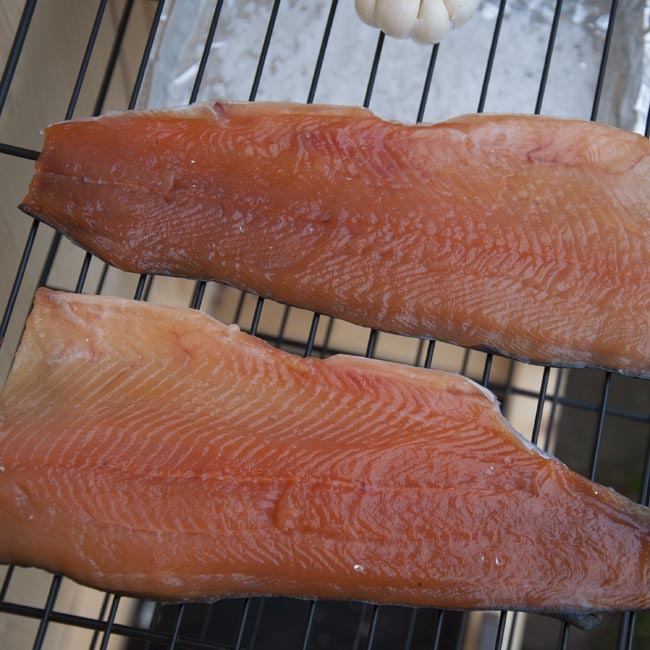 Smoking fish in this way isn’t really a preserving mechanism, and storage time in the fridge is about 3 – 4 days. Even if I’m going to eat them very soon, though, I tend to freeze them at this stage – a day or two in the freezer should ensure any parasites which may be present in the fish have been killed off. You can keep them frozen for a couple of weeks without too much loss of quality, but after a month or so you’ll start to notice the deterioration. Once thawed, I slice the smoked trout thinly with a sharp knife, starting at the ‘head’ end of the fillet, at about a 45 degree angle. There’s a bit of a knack to this, but you’ll get good at it really quickly – and who cares if the slices are thicker, or a bit uneven? This produces small, almost translucent slices which are great for nibbles. I love to serve these with water biscuits or oatcakes (or your preferred sort of cracker), cream cheese – or a soft goat’s cheese is also very nice, freshly ground black pepper and a squeeze of lemon juice. But the limit is really your imagination. Smoked trout with scrambled eggs on a toasted muffin is a beautifully indulgent breakfast! I really do hope you chose to give home-smoked trout a try, and that however you prepare and enjoy it, it brings you as much foodie pleasure as it brings me! This entry was posted in Curing, Fish, How-to, Preserving, Recipe, Slow Food, Smoking, Special Occasions, Tested and tagged country skills, curing, fish, food, home-smoking, how-to, recipe, smoking by Kate Watson. Bookmark the permalink. I’m afraid I don’t usually hot-smoke fish but I suspect you’ve over cooked it!